Toronto Hydro is reporting that approximately 6,000 customers are now without power. Hydro One crews and personnel from Hamilton, Sault Ste Marie, Windsor, Ottawa and Manitoba are assisting with the restoration efforts. In situations where the homeowner is required to make repairs before the power can be restored, the homeowner will need to provide Hydro with the ESA inspection certificate number and customer contact information. Homeowners are advised to call 416-542-8000 with this information so that Hydro can initiate a work order. There are currently 70 Forestry crews and 17 staff in single vehicles triaging calls and working closely with Toronto Hydro. There are also 13 forestry crews from Ottawa and London that are assisting Toronto’s forestry staff with debris removal. Members of the public are urged to be aware of their surroundings. Residents are urged to watch for falling ice around buildings, large structures (such as cranes), and vehicles, particularly around large trucks. Residents are also urged to exercise extreme caution and avoid walking under trees that are covered in ice, particularly in parks, wooded valleys, and near playgrounds. Toronto Fire and Emergency Medical Services (EMS). Call volumes continue to be higher, but are approaching normal levels for both Toronto EMS and Toronto Fire Services. When power does return to your home, check all appliances and ensure they are operating properly. The Ontario Provincial Police and Toronto Police Services have been canvassing door-to-door in neighbourhoods where power outages continue. Residents are asked to please check on seniors and vulnerable residents. Work to clear all tree debris is expected to begin January 3 and it will continue for approximately eight weeks, weather permitting. Only use a chainsaw that you have been trained to use properly and safely. Always wear protective equipment and clothing. Be aware of your surroundings such as weather conditions, terrain, wildlife, buildings, power lines, vehicles, and other people. An estimated 30 traffic signals remain without power. There are more than 40 Transportation crews currently addressing debris management especially around schools, and there are more than 40 crews focused on repairing potholes again today. 108 people were accommodated last night. All TDSB sites that have childcare will be open tomorrow except for Fairmount, Hillmount, and Broadlands. Also, all City operated centres will be open tomorrow. Also, Ontario is making arrangements to obtain and distribute grocery store gift cards to help people replace food they may have lost as a result of the storm. December 29, 2013 10:16 a.m. Significant progress has been made in restoring power to residents across Ontario. Hydro One is working with Toronto Hydro to add more resources to their effort. Efforts are also being made to help people replace food they may have lost as a result of the storm. The Office of the Fire Marshal and Emergency Management is working with its Supply Chain Alliance partners to obtain and distribute grocery store gift cards to these Ontarians. Details will be made available on Monday. 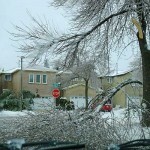 At the start of the ice storm, more than 600,000 customers were without power. Progress has been made to bring the remaining impacted customers back online. Updates on power outages caused by the storm can be found on most local utility websites or at http://www.ontario.ca/warning. Several warming centres are open in the GTA to give people a respite from the cold. Visit ontario.ca/warning for the latest information and locations for warming centres. The health system across the GTA has stabilized and hospitals are open and currently able to meet patient needs. The Ontario government is also working with municipalities and volunteer organizations to coordinate visits to seniors and other vulnerable individuals to ensure they are safe. Ice is melting and falling off trees and tall buildings as a result of warmer temperatures. People should avoid walking under trees and be extremely vigilant while outdoors. If hydro wires connected to your home appear damaged, do not touch them, even if you believe the power is off. Do not attempt the repairs yourself; instead, call a licensed electrical contractor to do the job. The Electrical Safety Authority has contact information for more than 7,000 licensed contractors at 1-877-372-7233 and www.esasafe.com. Or consult your local telephone directory.